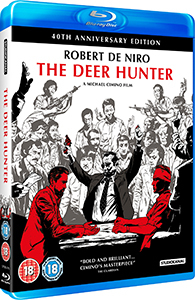 To celebrate the film’s 40th Anniversary, Michael Cimino’s epic masterpiece The Deer Hunter has been stunningly restored with a brand new 4k restoration, releasing on Blu-ray, The Collector’s Edition and EST 20th August, and on 4K Ultra HD 15th October. For one day only, Park Circus will showcase the film in cinemas from 4th July – the release date coinciding with America’s Independence Day. Winner of no less than five Academy Awards® in 1978 including Best Picture, Best Director and Best Supporting Actor for Christopher Walken, The Deer Hunter is widely acknowledged as one of cinema’s great masterpieces and contains some of the most memorable scenes in film history. With the film painting a sobering portrait of a small Pennsylvania steel town rocked by loss when three of its sons go off to fight in Vietnam, Cimino’s ambitious and daring vision is showcased in this bold and brilliant war classic – that, 40 years on, is even more striking than ever before. When Michael (Robert De Niro), Steven (John Savage) and Nick (Christopher Walken) are captured by the Vietcong, they are forced to play Russian Roulette by their brutal captors, who make bets on their survival. The experience of capture leaves them with terrible physical and spiritual wounds, and when Michael returns to Saigon to fulfil an old promise to one of his friends, he makes an unexpected, horrific discovery. Also featuring astonishing performances from Meryl Streep as the woman both Michael and Nick fall in love with, and John Cazale (The Godfather, Dog Day Afternoon) as their unhinged and insecure friend Stan. For the 40th Anniversary restoration of The Deer Hunter, STUDIOCANAL went back to the original 35mm negative, which was scanned at 4K resolution in 16bit. The restoration was completed at Silver Salt in London, who created a restored 4K DCP and UHD version for the home entertainment release. The competition closes at 23.59 (GMT) on Sunday 19th August 2018.